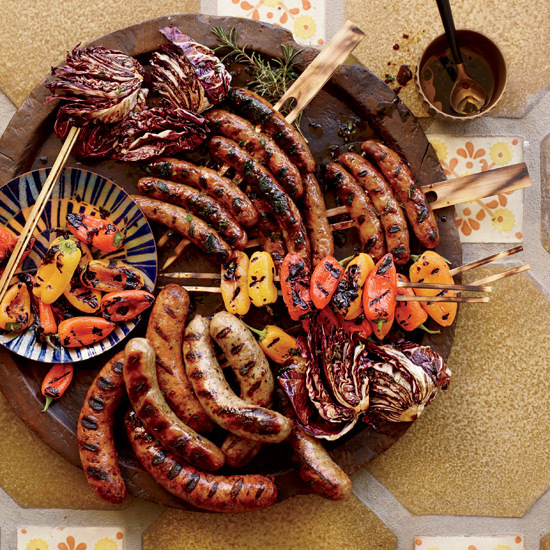 Any and all sausages are welcome in this delicious feast. We like to use breakfast sausage, weisswurst and either hot or sweet Italian sausage. When it comes to grilling, chef Adam Sappington of The Country Cat in Portland, Oregon, is a big-time fan of brining—especially using boozy brines. “Home chefs can sip on a beer or open a bottle of wine one night and have the perfect brining ingredient for the following day,” he says. Here, he shares five recipes to amp up flavor on the grill. When it comes to grilling, chef Adam Sappington of The Country Cat in Portland, Oregon, is a big-time fan of brining—especially using boozy brines. “Home chefs can sip on a beer or open a bottle of wine one night and have the perfect brining ingredient for the following day,” he says. “Brines not only season the meat, they also add a foolproof method for keeping proteins moist through the cooking process. They are a great way to add or incorporate more flavor and spice to a dish without having to create a sauce or another component.” Below, Sappington shares five versatile recipes to amp up flavor on the grill. Pro tip: Sappington recommends immersing the meat in these brines for at least 2 and up to 12 hours. Pieces of fish 5 pounds or larger can sit in the brine for 2 days; similarly sized pieces of meat can brine for up to one week. Pairs well with: salmon, pork or chicken. In a large stockpot, add all ingredients and bring to a boil. Boil for 3 minutes. Cool completely before using. Pairs well with: chicken, pork or brisket. In a large bowl or jug, add all of the ingredients and whisk together vigorously to dissolve the salt and sugar. Let sit for 1 hour. Pairs well with: halibut, salmon or trout. Pairs well with: pork or chicken thighs. In a large stockpot, add all ingredients and bring to a boil. Boil for 3 to 5 minutes. Cool completely before using. Pairs well with: trout, chicken or pork.